A farrier is a specialist in equine hoof care, including the trimming and balancing of a horse's hoof and the placing of shoes to the horse's foot. A farrier couples a subset of the blacksmith's skills (fabricating, adapting, and adjusting metal shoes) with a subset of veterinary medicine (knowledge of the anatomy and physiology of the lower limb) to address the care of the horse's feet. At one time, farrier and blacksmith were all but synonymous. A farrier's work in colonial America or pre-Industrial Revolution Europe would have included horseshoeing as well as the fabrication and repair of tools, the forging of architectural pieces, etc. 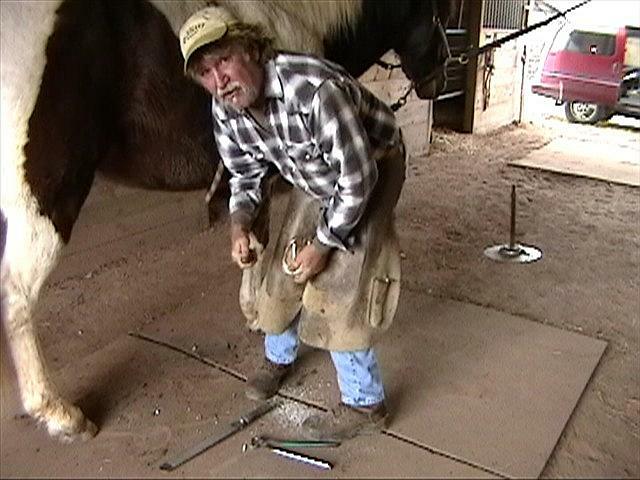 Today, farriers usually specialize in horseshoeing, focusing their time and effort on the care of the horse's foot. For this reason farriers and blacksmiths are considered to be in separate, albeit related trades. Additional tasks for the farrier include dealing with injured and/or diseased hooves and application of special shoes for racing, training or "cosmetic" purposes. In cases of horses with certain diseases or injuries, special remedial procedures may be needed for the hooves, and then special shoes may need to be constructed and fitted. In the United Kingdom, it is illegal for anyone other than a registered farrier to call themselves a farrier or to carry out any farriery work under the Farriers (Registration) Act 1975. The primary aim of this act is to "prevent and avoid suffering by and cruelty to horses arising from the shoeing of horses by unskilled persons."